After all that talk about Top Chef: Just Desserts, I missed it! We recorded the show, but after settling in to watch the Top Chef finale, I drifted off to sleep before the new Top Chef was even announced (though I did wake up briefly to find out who it was). So I’m a day behind on Top Chef and will have to avoid reading updates and reports until tomorrow. Luckily, I stayed awake long enough to try a piece of the celebratory Top Chef Just Desserts Pie I’d made earlier. Given the occasion, I wanted to make something a little different – not complicated, just something I’d never tried before, and this recipe seemed interesting. Unlike traditional pineapple pie which has a cooked filling and typically only a tablespoon or so of milk, this one has a filling based on sour cream. 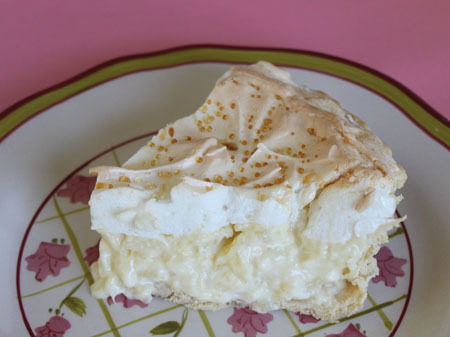 The sour cream gives it a smooth, creamy, flavor not unlike that of Millionaire pie, but perhaps a little less sweet and of course, a bit tart. Another plus is that this pie is extremely inexpensive and easy to make. It does involve stirring the filling over the stove, but it’s a very quick and painless process and I didn’t have any issues with lumping. For the crust I used a traditional pastry crust, but I think graham cracker crust would have been terrific. As for the meringue, I wasn’t sure I’d like a meringue topping on a pineapple filling, but it worked. The meringue was light and airy and kind of a relief from the filling. For those of you who don’t like meringue, whipped cream would be great – richer, but still good. 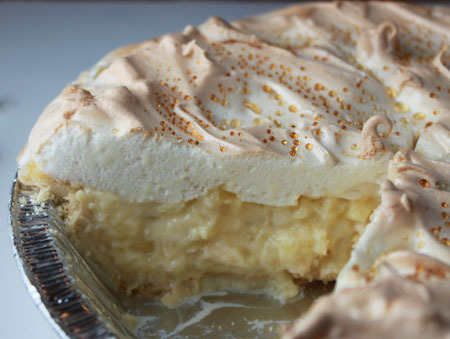 But if you like meringue, you might want to try the meringue version first. I wish I’d come up with this recipe, but it’s adapted from a 1997 Better Homes and Gardens. Still, there’s lots of room for improvisation. The filling, minus the meringue, would probably make an excellent filling in a coconut or vanilla layer cake. I’m dying to try that, but we need to finish this pie first. Separate the eggs. Put whites in bowl of stand mixer. Put yolks in a separate mixing bowl, then whisk them a bit and cover. Let stand for 30 minutes to come to room temperature. In a heavy saucepan, combine the 1/2 cup sugar, flour, pineapple and sour cream. Turn on the heat and cook and stir over medium heat until bubbly and hot. Whisk about half of the sour cream mixture into the egg yolks, then whisk egg yolk mixture into the saucepan still set over medium. Cook and stir until you hit a gentle boil, then continue cooking and stirring for two minutes. Transfer hot filling to a baked 9 inch pie crust and immediately cover with meringue. To make meringue, beat the egg whites until soft peaks start to form and gradually add sugar, cream of tartar and vanilla. 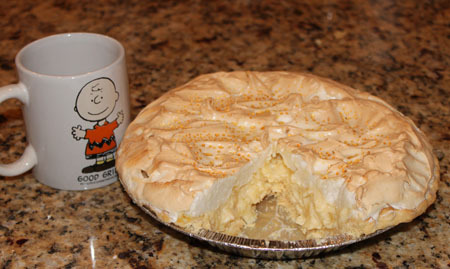 Set the meringue covered pie on a cookie sheet and bake at 350 F. for 15 minutes or until meringue is lightly browned. Let cool at room temperature for an hour, then chill for 3 to 6 hours or until ready to cut. All cook times and prep times are approximate. I’ve never seen a pie like this before!! It looks so good. I made this yesterday and everyone really liked it. I think it’d be great with an addition of coconut, but then I love coconut! Sounds delicious, Anna. I actually made a sort of similar pineapple pie nearly two years ago from an old Bake-Off cookbook! Seeing this post reminds me of how good that pie was, and I’m sure this one is equally tasty. I think I see another pineapple pie in my future – I’m feeling inspired now! Ooohhhh…I love the idea of that filling between the layers of a cake. It sounds scrumptious! I am relieved to know that people younger than me fall asleep during TV. I don’t comment often but I really enjoy your blog. It looks delicious. I will have to try this. The filling sound wonderful! That is so funny…I forgot about Top Chef desserts entirely until I saw that it was to be repeated last night. So I caught up with it. You don’t see too many recipes for pineapple pie! I love yours. I haven’t watched it either. I usually watch it online on Hulu. This pie looks amazing. Do you mind if I link to it tomorrow night on my blog? I don’t make too many pies but I can certainly drool over them! I missed Top Chef Just Desserts last night too! I don’t have Tivo but Bravo reruns episodes all the time, so I’ll have to seek out if it’s on again this weekend! i just wasn’t expecting all the divaness on TC Deesserts. Not like the original TC at all. Good creations thou, i must make those fried choco mini hand pies. Oooooh my goodness. I am dying to eat this right now. Yum! That makes me so hungry…I may skip dinner and go straight to dessert. And I stayed up until 2am becuase I read your blog after getting home at 11 and had to watch! I just finished emailing you and asked if you’d seen Just Desserts yet and if you made the pineapple pie. Then I headed over here and got both my answers. I haven’t watch it yet either, so we can be in the dark together. Or how about using the pineapple mixture as a filling for angel food cake? – similar to the Pineapple Lush cake in Dole advertisements some time ago, which I cut out but haven’t gotten around to trying! This sounds very interesting! Anything with pineapple is good, right? ?